I think the greatest thing about the vegan blog community is that there are always new recipes to try. Such is the case with cookbooks as well, but there’s something special about finding a recipe on a blog and being able to tell the person who came up with it that you want to make it, are about to make it or made it and loved it so much that you can’t wait to make it again. There’s a sense of camaraderie among food bloggers that results in tasty meals being shared from one side of the country (or the world) to the other. 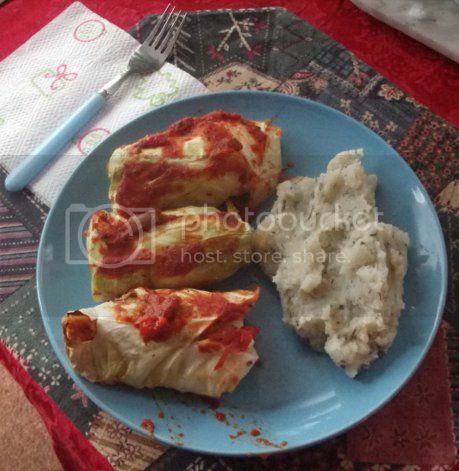 I recently experienced this around St. Patrick’s Day, when a very lovely recipe for Quinoa Stuffed Cabbage from the Vegan Version blog appeared in my Twitter feed. I cook special dishes for holidays like Christmas and Easter, but not usually for St. Patrick’s Day. However, this recipe really struck my fancy. 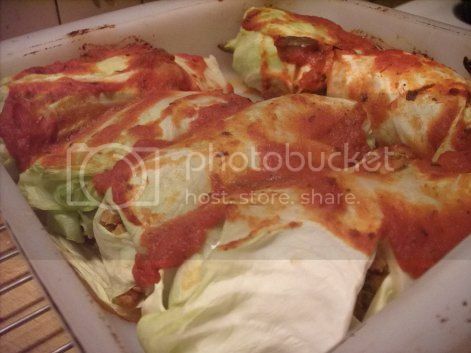 I’m a big fan of both cabbage and quinoa, I like wraps and “stuffed” food and the Italian in me can never resist something smothered in good tomato sauce. All of these elements together in one dish created something pretty darn irresistible. And since cabbage is practically free at every local grocery store around St. Patrick’s Day, it wasn’t hard to get together everything I needed. The only thing I wound up not having was the vegan cream cheese for the filling. I had some in the fridge, but was distressed to find it growing a rather vibrant red mold when I opened the container. (Don’t you hate it when that happens?) Instead, I used some unsweetened plain vegan yogurt. That worked just fine to stick the filling together and had a mild enough flavor that I didn’t even notice it was there. And the chopped kale in the filling? Inspired. I didn’t have the patience to boil the entire head of cabbage, so I pulled off leaves as carefully as I could and steamed them instead. That meant some of them ripped a bit, but overall it worked out. And, of course, it didn’t affect how delicious the finished product was! Another blog I stalk rather obsessively is Healthy. Happy. Life. The food photography alone is enough to make you want to drool intp your keyboard. Every post is chock full of gorgeous pictures, and consequentially takes about fifteen minutes to load on my dialup connection, but the wait is worth it. I recently went back to this blog when I was craving something like a veggie burger, but didn’t know exactly what I wanted. I guess I wanted these! “Sloppy Nellys,” a.k.a. 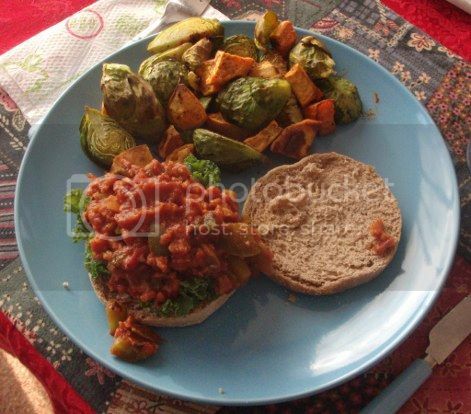 vegan sloppy joes made with TVP. And not just TVP–lots of veggies as well! I don’t cook with TVP a lot because I find that large quantities of it tend to disagree with my stomach, but these sandwiches have a great balance of TVP chunks, vegetables and sauce. And they are sloppy! Both my mom and I had to make a start eating the sandwiches with our forks before we could even think about picking them up. As per the recipe’s suggestion, I put a little (homemade) vegan mayo on mine, then added a kale leaf because it sounded more awesome than lettuce. These get two thumbs way up from me! They’re just saucy enough to be sloppy, the texture is classic without being too much like ground beef and the flavor balance is delicious. Plus they’re not hard to make. I served them with roasted sweet potatoes and Brussels sprouts, which I think completed the meal rather well. 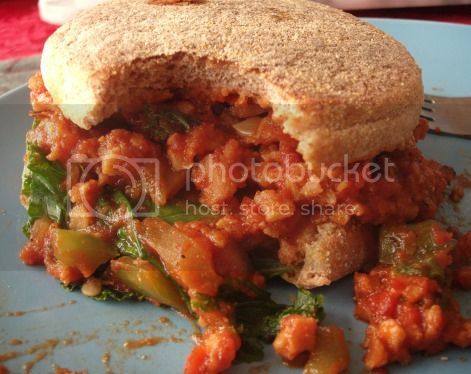 I’ve made several vegan sloppy joe recipes before and always liked the lentil one from Veganomicon, but these are at least that good, if not better! Have a favorite vegan recipe from a blog or a favorite vegan blog in general? Share it in the comments! You are just so sweet! Thanks for the kind words about the recipe; I am glad you enjoyed it. And I agree– what a wonderful community the vegan food bloggers out there are! I love that you are never more than a google search away from a great new recipe or inspiration. And I do love the feedback! I have too many favorites vegan blogs to list but am thankful for every one of them- yours included! !